Many American and Canadian expats who are considering moving will want to have a certain degree of familiarity, at least at first and if you have children who will be attending and American school then one of the best areas to live in has to be St. John’s Wood. It is also one of the more pricey neighbourhoods of London; certainly, it attracts a fair share of celebrities and the ultra wealthy. St. Johns Wood, though, is one of the friendliest and safe suburbs of London and having the American School in London means that it is a huge draw card for Americans with young families. There are beautiful homes in St. Johns Wood as well as a number of parks and green areas, quaint shops and outdoor eateries lining the tree lined avenues. 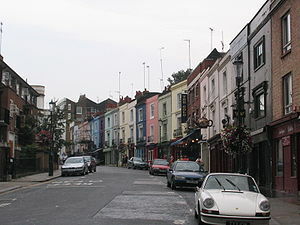 Notting Hill on the other hand is the trendy spot for Americans and other expats to live in. It was made famous by the film of the same name that starred Hugh Grant and Julia Roberts and many expats are drawn to the lifestyle as opposed to specifically enjoying the area. It is also an expensive area to live in, but it is so charming, bohemian and quirky that you will fall in love with it immediately. The homes in this neighbourhood are small; do not expect wide lawns and gardens here. If you want to escape the bustle of Notting Hill then the closest park is the exquisite and beautiful Kensington Gardens that are nearby. Notting Hill is home to the famous Portobello Road flea market and it is a lively sopping experience for anyone who is new. The neighbourhood is young, trendy and definitely up and coming. It is a fabulous place to get out and meet new people from all over the world who have flocked to this city for the time of their lives. Meeting new people is easy. This is a city of travellers and has a large population of expats from all over the world who will be as interested in learning about as you are in learning about them. That is the key really: Get out there and start having fun in your new city. This of the best places on the planet to live in.